The argument can certainly be made that The Beatles are the greatest music group in the history of sound. Sure, we could have a debate about that for weeks, but that’s not my point. The Beatles were great, so surely any bands they signed to their Apple label had to be pretty good too, right? The Iveys formed in Swansea, Wales in 1961. Consisting of vocals, lead guitar, bass guitar, rhythm guitar and drums, they would seem to have a pretty standard rock sound for the time. Named after a well-known street in Swansea called Ivey Place, they locally toured and started to create a buzz. By 1965 they were opening for such British acts as The Who, The Moody Blues and The Yardbirds. Wanting to branch out their sound, in ’66 they began touring London doing covers. Everything from Motown, blues, soul and Top 40—all the way to psychedelic rock and some Beatles material. They signed to a small label with a not-great deal, but at least it was something. When Beatles roadie/assistant Mal Evans and the A&R man for Apple Records came to see them perform live, they knew they wanted to steal them away. Demo tapes began seeing their way to each Beatle consistently until they were all on board with the signing. That would finally happen in July of 1968. While everything was looking up, that’s about where it ended. Apple was rejecting most of The Iveys’ music and they were not breaking out. In 1969 their guitarist decided to leave the band, forcing the band to go through some changes. With those changes came a decision to rename, specifically to reference a proposed Beatle song ‘Bad Finger Boogie’. 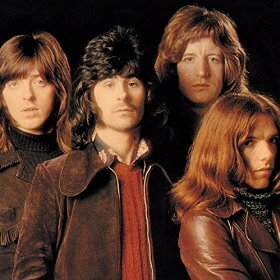 The band accepted and Badfinger was born. Today we look at their third studio record Straight Up which was released in December of 1971. Apple and George Harrison heavily involved themselves in the recording, which created a different sound. More of a ballad influenced power pop versus typical straight up rock’n’roll. Reviews were initially mixed, but have turned today into this unquestionably being known as the bands best album. In spite of some success of the lead singles, the band never felt they got out of the Beatles shadow, and went through even more changes after this record. Maybe a year ago or so I picked this album up for the first time. I’d heard maybe only one track off it before, so it was all new to me. I really enjoyed it – and picking it back up today, it’s an incredibly solid record. Learning more about their background was fascinating because a band that created such good music never really got a fair shake. If they do have a similar sound to the Beatles, they take it up a level in spots. The top three tracks listed below in my opinion would stack up against anything Lennon or McCartney put out. Ham’s vocals and range were incredible, and not nearly appreciated enough at the time. Badfinger may not have become the household name Apple Records was hoping, but boy is this a good one. Five bucks is a steal for a piece of music history – so toss the Beatles a few more dollars today and pick this one up. Very cool to recognize Badfinger as one of the bands whose work has gained greater respect as time has passed. Day After Day still sounds fresh today! Thanks! Take Austin’s recommendation–this is an album worth giving a listen! Thanks for the comment Mike. The blog manager didn’t think she knew any of the songs, but as soon as she put Day After Day on – she knew it ASAP. I think they have at least half a dozen songs just about everyone would recognize, just don’t know the band name.